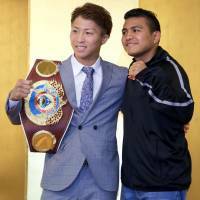 Inoue, Gonzalez ready to make splash in U.S.
Japanese youngster Naoya Inoue and former pound-for-pound No. 1 fighter Roman Gonzalez will both enter the ring with extremely high motivation — but for different reasons — when they compete in their respective bouts on Sept. 9 on the West Coast of the United States. Inoue’s motivation stems from the fact that he’s making his U.S. debut. The 24-year-old will square off against Antonio Nieves as he makes his sixth WBC super flyweight title defense. Inoue is unbeaten with a 13-0 record (11 KOs) in his professional career, but his first bout overseas has seen his motivation rise to a new level. Meanwhile, Gonzalez, who is promoted by Japan’s Teiken Promotions, is also fired up for his upcoming match, as he stunningly suffered his first professional loss in March. “Chocolatito” fell to challenger Srisaket Sor Rungvisai of Thailand in a WBC super flyweight title match at Madison Square Garden in March. Because Gonzalez (46-1, 38 KOs) lost in a majority decision, a result many were skeptical about, he has earned a shot at a rematch with a chance to retrieve the belt he lost. The venue for Inoue’s fight will be announced at a later date, but it’s believed that it will take place in the Los Angeles area. Inoue said that he will have to be aware of the time difference and how to tune himself up since he’s fighting overseas for the first time, but that his training leading up to the bout will not change. Inoue added that he will have to put on a show for the fans, assuming that most of them don’t know much about him, in order to build his reputation and have more fights in the U.S.
Shingo Inoue, Inoue’s father and trainer, said the fans in the U.S. tend to be excited when fights end in a clear-cut manner, but that he is certain they will love his son’s style of fighting. Although Puerto Rico’s McJoe Arroyo had originally been rumored as a potential opponent for Inoue, it wound up being Nieves. Inoue, however, was unconcerned with whom he would be facing and didn’t have much of a problem with how it turned out. Nieves is a Cleveland native and has a 17-1-2 (nine KOs) record in his pro career. The 30-year-old lost his WBO NABO bantamweight title to Nikolai Potapov in March. Nieves is currently the No. 7-ranked boxer in WBO’s bantamweight list. It had previously been speculated that Inoue and Gonzalez could fight each other, but those talks suffered a setback with the former four-division world champion’s loss. Nonetheless, both men said they would still like to box against each other in the near future. Inoue said, however, that the match against Gonzalez, who had been No. 1 in the Ring Magazine pound-for-pound list until his defeat against Srisaket, would have to happen soon, as it is getting harder for him to stay in the weight division. Gonzalez is currently ranked No. 3 while Inoue is at No. 10 on the pound-for-pound list. The Gonzalez-Srisaket fight will be the main bout and the Inoue-Nieves one will be held right before it on the undercard. Two other globally renowned super flyweights are fighting on the same undercard. Carlos Cuadras of Mexico (36-1-1, 27 KOs) and Juan Francisco Estrada (35-2, 25 KOs), also of Mexico, will face against each other in a match to determine the next challenger for the WBC super flyweight title. Japan’s Fuji TV will broadcast the event, which will also air on U.S channel HBO.